Mr. Hoover, at the Living Legends of Aviation Awards ceremony in Beverly Hills, Calif., menaced German aviators in World War II and wowed fans with his aerobatics. 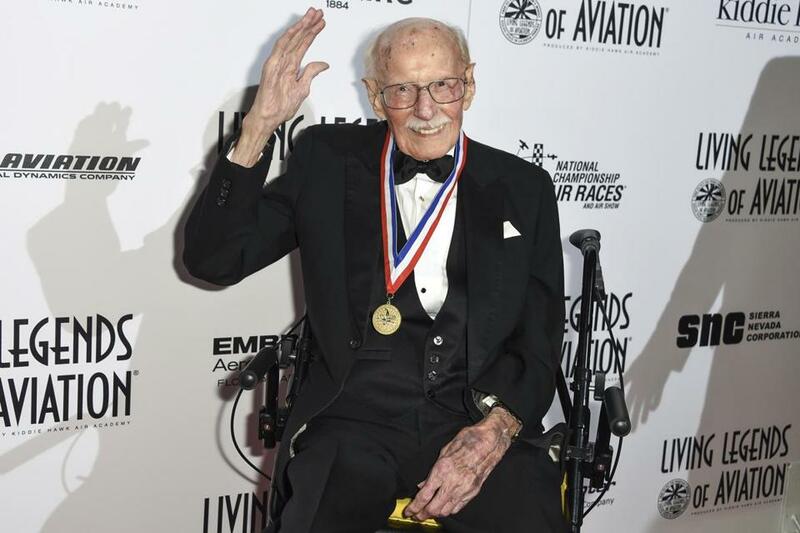 NEW YORK — Bob Hoover, a pilot who escaped Nazi captivity in a stolen plane, tested supersonic jets with his friend Chuck Yeager, barnstormed the world as a breathtaking stunt performer, and became, by wide consensus, an aviation legend, died Tuesday in Los Angeles. He was 94. At a World War II air base in the Mediterranean, he wrote, he terrified senior pilots who had been lording over him by flying a P-40 fighter under a bridge while they were standing on it. At an international aerobatic competition in Moscow in 1966, he put on a thrilling but unauthorized display, flying upside down and executing spectacular loops in a Yakovlev-18. By his account, the stunt upset his Soviet hosts, and he escaped KGB custody only after the intervention of a mildly inebriated Yuri Gagarin, the first man in space. The two had struck up a friendship. Indeed, Mr. Hoover could trace the history of aviation, to the dawn of the Space Age, by the men he came to know: Orville Wright and Charles Lindbergh, Doolittle and World War I flying ace Eddie Rickenbacker, and astronauts Walter Schirra and Neil Armstrong as well as Yeager and Gagarin. Mr. Hoover’s trademark maneuver on the show circuit was a death-defying plunge with both engines cut off; he would use the hurtling momentum to pull the plane up into a loop at the last possible moment. But his stunts were not foolhardy. Each involved painstaking preparation and rational calculation of risk. “A great many former friends of mine are no longer with us simply because they cut their margins too close,” he once said. His favorite plane in the 1950s and ‘60s was “Old Yeller,” a P-51 Mustang fighter painted bright yellow. Mr. Hoover sometimes shunned flight suits to perform in a business suit (less trouble for the undertaker in case of an accident, he once said) and a trademark Panama straw hat. He once invited a crew from the ABC program “That’s Incredible!” to film him in action, pouring a glass of iced tea with one hand while he rolled his plane 360 degrees with the other. Robert Anderson Hoover was born Jan. 24, 1922, in Nashville. His father, Leroy, worked for a paper company while his mother, Bessie, kept house. Bob started to fly as a teenager, “working 16 hours in a grocery store to earn 15 minutes of flight time,” as he told an audience of young admirers. He taught himself the loops and hand rolls of aerobatics, enlisted in the Tennessee National Guard, and received orders to Army Pilot Training School. With the onset of World War II, he was sent to England as a flight instructor for the Royal Air Force. The Army Air Forces later assigned him to Casablanca, Morocco, where he tested newly assembled and repaired planes and ferried them to the front. Valued as an operations officer, he was nevertheless hungry to fight and, through persistence, persuaded his commanders to grant him combat duty. “I can hit a target upside down or right side up,” he said he told a general. Lieutenant Hoover flew 58 successful missions before his Spitfire fighter was shot down by the Luftwaffe in February 1944. He spent 16 months in Stalag Luft I, a prisoner of war camp in Germany reserved for Allied pilots. Mr. Hoover and a friend escaped from the camp in the chaotic final days of the war, according to his memoir. Commandeering an aircraft from a deserted Nazi base, he flew it to freedom in the newly liberated Netherlands, only to be chased by pitchfork-wielding Dutch farmers enraged by the plane’s German markings. He remained in the military after the war as a test pilot based at Wilbur Wright Field in Ohio (now part of Wright-Patterson Air Force Base). There, with jet-propulsion planes replacing propeller aircraft, he took on the dangerous duty of working out kinks in workhorses such as the F-80 and P-51 fighters. Yeager was also a test pilot there, and in the fall of 1945 they became friends after getting into a spontaneous mock dogfight that ended in a draw. They were soon performing in air shows around the country. Both men were recruited to train together at Muroc Field (later named Edwards Air Force Base) in California to fly the Bell Aircraft X-1, the jet that broke the sound barrier in October 1947 over the Mojave Desert. Mr. Hoover might have gotten the call to pilot the plane if his rambunctious streak had not undone him, Kaplan said. Earlier that year, he had buzzed a civilian airport in Springfield, Ohio, in an experimental military jet as a favor to a friend; the friend wanted his relatives in the area to think that he was flying the aircraft. Commanders discovered the episode, and Mr. Hoover was relegated to flying the “chase” plane during the X-1 test flights, making observations and taking photographs, while Yeager made history. After leaving the Air Force, Mr. Hoover became a test pilot for General Motors and then North American Aviation. He was one of the most honored pilots in US history. His military awards alone include the Distinguished Flying Cross, the Soldier’s Medal of Valor, the Air Medal with Clusters, the Purple Heart, and the French Croix de Guerre. In 2007 he received the National Air and Space Museum Trophy, the museum’s highest honor. Mr. Hoover’s wife, Colleen, died recently. They had lived for many years in the Los Angeles area. He leaves a son, a daughter, and several grandchildren. Mr. Hoover flew well into his 80s, but not before clashing with the authorities when he was 72, in 1994, when medical examiners from the Federal Aviation Administration declared him unfit to fly, saying that his “cognitive abilities” had diminished. Mr. Hoover quickly recertified himself in Australia and began a legal battle back home, led by defense lawyer F. Lee Bailey, who had befriended him through a mutual love for flying helicopters.